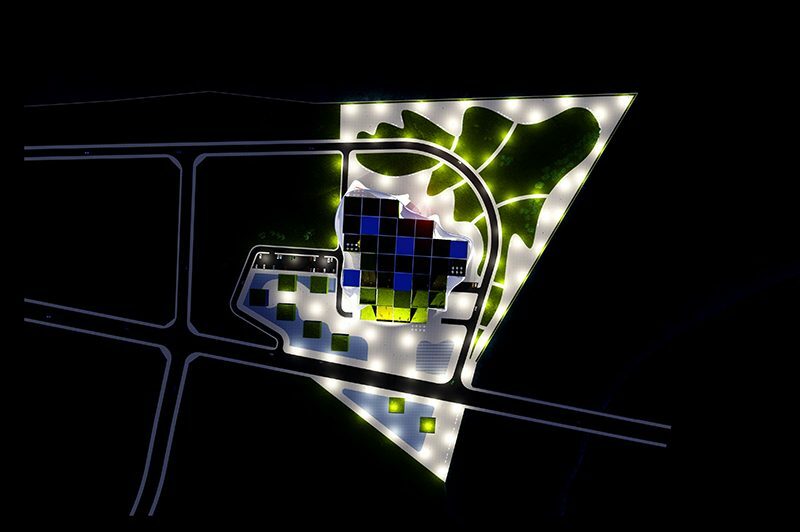 The green cubes symbolize the nature and provide optimum microclimate in the area. The second topic is the sculptural surface which symbolizes a paper sheet / the paper is basically the main creative artistic tool by itself for every artist/. 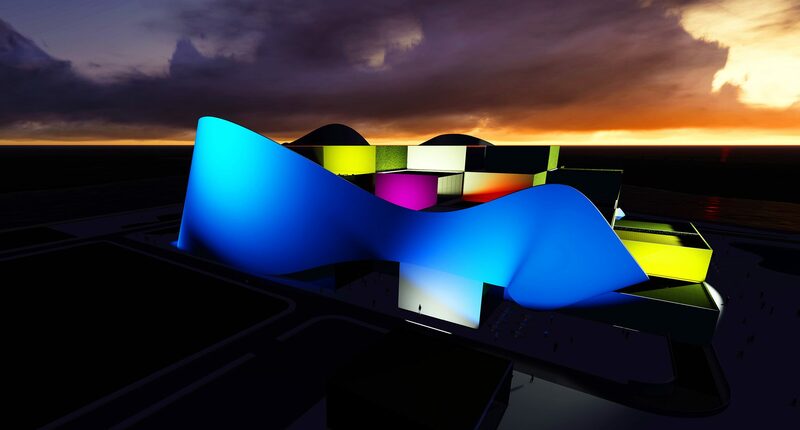 The project is located in Dongguan, Guangdong province, China, and is a multifunctional building for art, with several different functions: art gallery, art shopping mall, studios for artists, club for the artists, art hotel, small commercial buildings for rent. 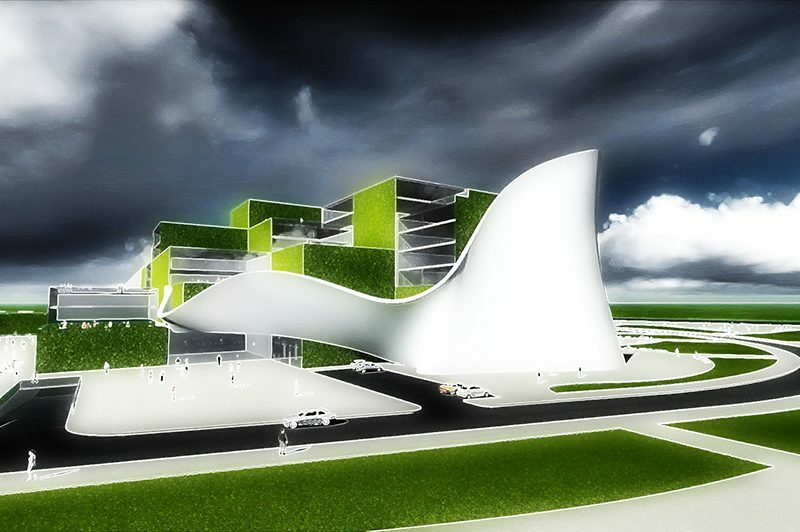 The concept is a set of green cubes packed with sculptural surface as a part of cubes go beyond the area of the main building. “The sheet of paper” will be made by material named “Corian“ by Dupont Company and will have an interactive features. In view of the fact that the building is situated between two rivers on a peninsula, it is the main visual point of view from one of the city’s main roads, but also from the opposite shores of the river. For this reason “the sheet of paper” would be used for multimedia purposes. Pictures, commercials, movies, fragments from the exhibition inside the building and etc. can be projected there. “Corian Dupont” is a material with an option to be semi translucent. In reality the surface will be white but due to its little transparency and using backlight, the light will change the color of the surface. The project provides maximum preservation of the existing vegetation, while adding a new one. The water, greenery, the white free surface are the basic motives and the purpose is to create a clean overall ensemble. The project is of particular importance for the development plan of the municipality of Dongguan, and the municipality actively promote and tolerate its construction as part of program for cultural development of the city. The project is expected to become one of the symbols of Dongguan and will be used for advertising the city.